Greenmarket happens Monday, Wednesday, and Friday in Union Square. It's a great place to get some cheap lunch (I like to get bread and greens and eat that with some store-bought cheese). Many local chefs shop there to stock up during the week. 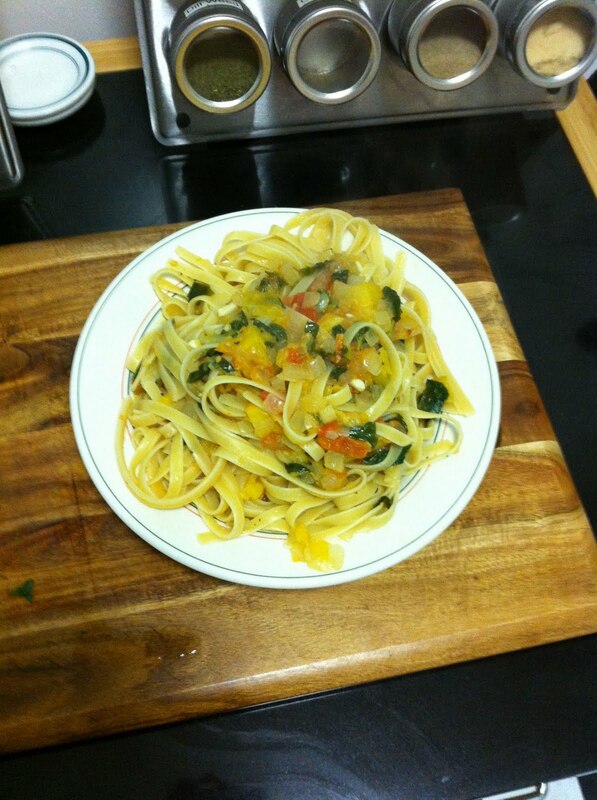 Rarely have I bought anything to cook for dinner, but this week I was itching to make a pasta sauce from scratch. All of the above were grown locally in New York State. The heirloom tomatoes have a rich, intense tomato taste and smell, the garlic is so fresh and pungent, and those onions...mmm! We'll get to them later. I loved mincing this garlic. The smell permeated the apartment, though not in an overbearing way, and this fresh it had such a spicier aroma than the usual garlic I get at the store. Is that 'cause it's local? Is it 'cause it's fresher? A different variety? I don't know. But it's good! Peel and mince the onions. Pre-heat a large saucepan over medium flame, then add two to three tablespoons of olive oil. 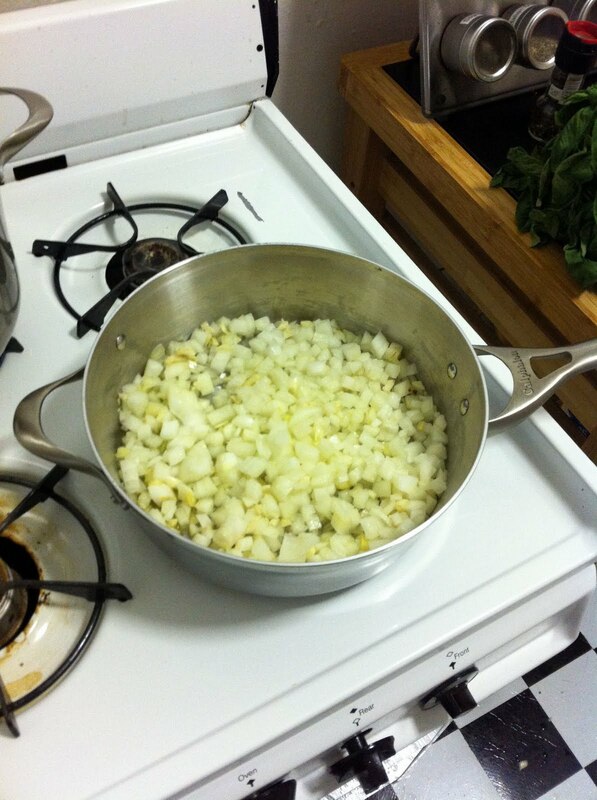 Once shimmering, add the garlic and onions. That is going to smell your apartment up something fierce! While you are cooking these until the onions are translucent, dice up the tomatoes. Most pasta sauce recipes call for blanching and peeling the tomatoes, but I like the flavour that the skin adds and it adds a nice texture, too. 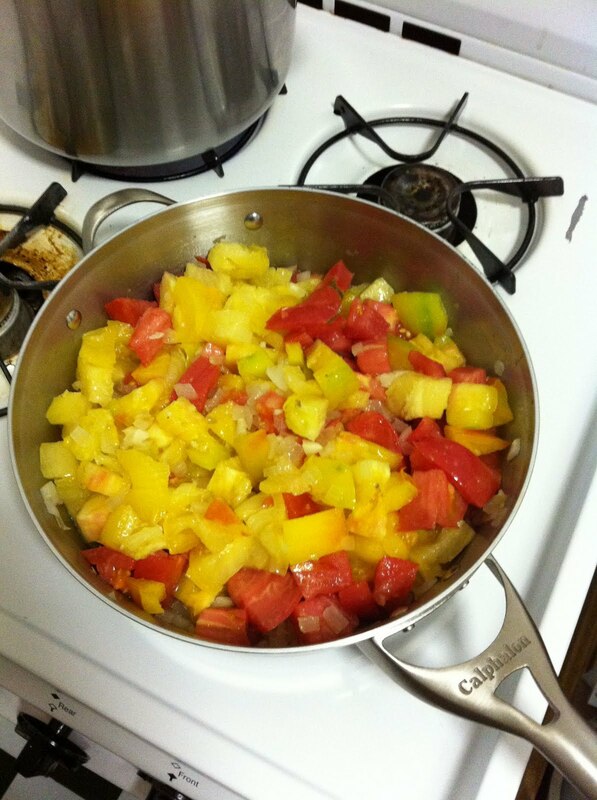 Add the tomatoes and gently mix in. Bring this to a simmer and keep it there. The liquid will start coming out of the tomatoes and mix in with the onions and garlic. The smell should be driving you mad right about now, hoping that you can eat it soon. 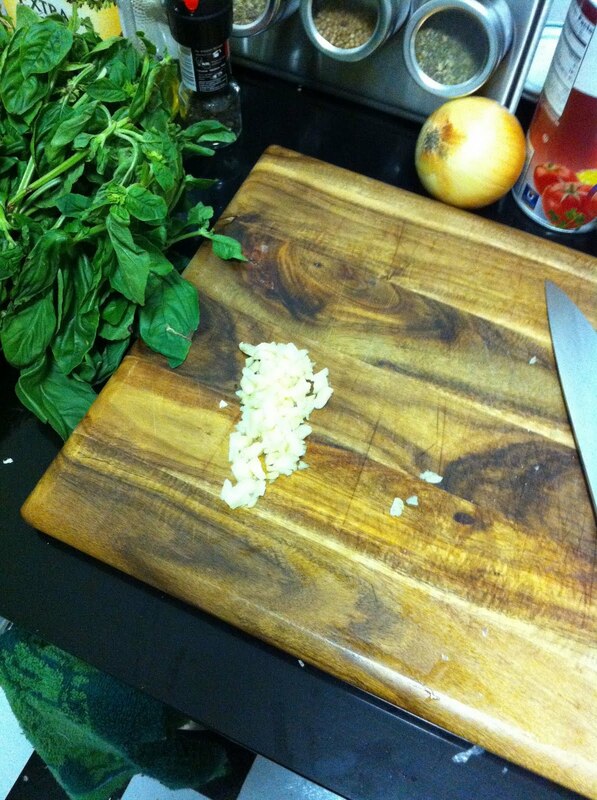 Well, chop up a generous portion of basil (I did two handfuls). 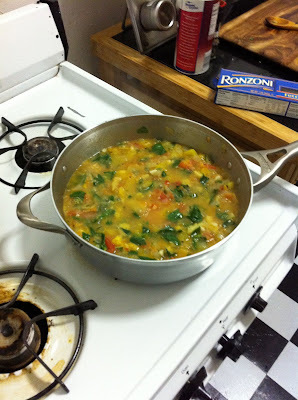 Then you're going to simmer this all together for about ten minutes. Then add salt and pepper to taste and simmer another hour. Of course you can put the water on and get it boiling toward the end of this, cooking up your pasta, or you can finish up and save the sauce for later. Once it has reached a consistency you like, turn off the heat. I didn't, and this is what Jeremy had for dinner that night. Seasoned with fresh pepper and grated parmesan. And also the next night with the Thrifty Sifter, when we had it over mushroom tortellini seasoned with fresh pepper and shredded parmesan. This sauce was really perfect. 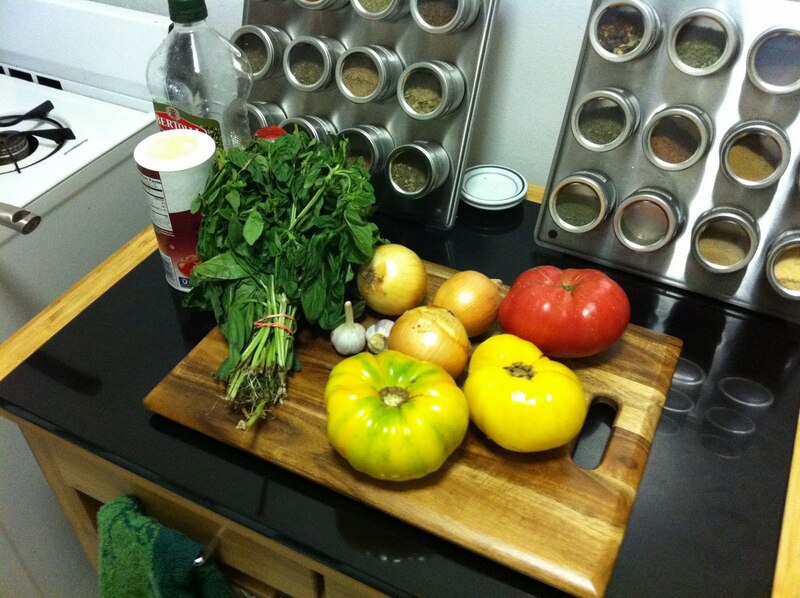 I am going to try to follow your recipe when I attempt my own sauce. You should give it a shot, Ali. If you don't sprinkle cheese in it it's 100% vegan and tastes great! The only expensive part was the tomatoes, which cost $12 all-told. Also we need to schedule our veggie burger cooking!